We took a trip into downtown Philadelphia over the weekend and I thought this was a fitting picture to share when saying Happy Memorial Day! 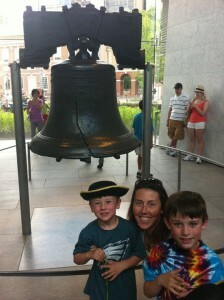 Here I am with the boys at the Liberty Bell. Let’s all take a minute today to remember everyone who risks their lives in the name of this country and to give us the freedom we sometimes take for granted. God Bless America! Absolulely Whitney. well said. Let us all remember to never forget.